OJ Simpson’s daughter, Arnelle Simpson, is spending her dad’s money with a quickness – and it’s partially to get back at him for divorcing her mother, Marguerite L. Whitley, and murdering her stepmother, Nicole Brown Simpson. OOOOh!!!! Here we go with some OJ Simpson drama, Guys, it seems that his daughter Arnelle Simpson has been spending a little too much money. Arnelle was put in charge of OJ’s assets in 2008 when he went to jail for that kidnapping, armed robbery and assault case. 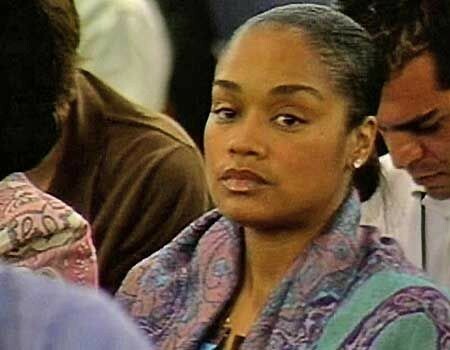 OJ Simpson gets $25,000 a month from his NFL pension and since Arnelle is in charge she gets it all. Well Ms. Arnelle is having herself a good ‘ole time it seems. She is shopping and eating at some very expensive places and let’s not forget the nonstop drinking of alcohol. OJ himself has been in touch with her from prison because he is worried about what he calls her ‘problem with alcohol.’ Not only is she spending the money on herself but she also treats her friends to drinking and dining on her father’s money. And that is not the worst of it; she has not paid anything on the mortgage of her father’s house in Florida. It has been reported that nothing has been paid on his house since 2010. OJ himself has his lawyers’ working with him so that his house will not go into foreclosure. OJ’s monthly mortgage on that house in Florida is only $3,133. The reason I say ‘only’ is that even if you are a spendthrift when you’re getting $25,000 you should be able to pay that amount for your home (but then again it would interfere with all that partying money, right, can we all say Arnelle is just a little selfish!). It Took 13 Years But…..Finally Justice Is Served! The Uncensored O.J. Confrontation in last Vegas..